The Artist Wife and I just returned from our first Steampunk Convention, Wild Wild West Con II (WWWC2). We had a fantastic time! The Artist Wife had a vendor booth, and her Vented Hats were a big hit, and generated a lot of buzz. We both learned a lot about what was available for sale and what people wanted, so next year will be even better! I also, for the first time ever, have an “art” commission, which is pretty amazing considering I’m not anything resembling a crafty person…I do much better with electrons than anything else. But I do have an order for some of my steampunk shotgun shells, and rest assured they’ve be on display here once I’m done with them! We also got to see various artists perform, including Professor Elemental, the Hip-Hop Steampunk rapper, Steam Powered Giraffe (the most awesome live band you’ve ever seen! ), The League of S.T.E.A.M., and Abney Park! I was quite stunned and pleased to be asked for my picture quite often (20+ times) — the outfit I was wearing (black dress slacks, white Victorian-style shirt, red canvas vest, gold silk cravat with squid stickpin, and a canvas duster) is quite striking! My “rose colored glasses” were also a hit! They are prescription lenses in pink tint (80%) from Zenni Optical, and they cost $25, shipped! 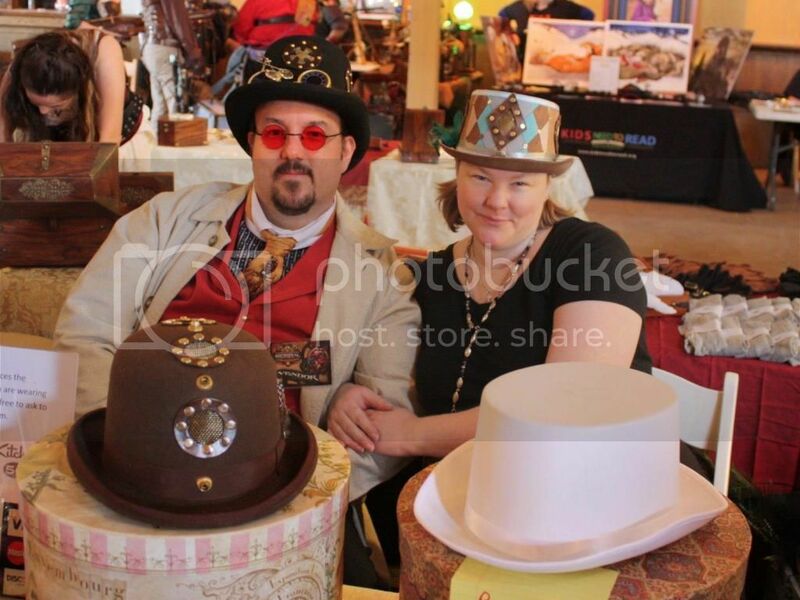 The biggest thing I need to change on my outfit is the weight of my vented top hat…It was the prototype for The Artist Wife’s vented hats (you can see a vented bowler in our pic above), and I used brass bolts and nuts, and its heavy! I just ordered (from ebay, of course) some nylon nuts to replace the brass ones on the inside of the hat that nobody sees…that should significantly lower the weight as there are 42 nuts(5 vents times 8 nuts) each of brass with nylon. Once they arrived, I’ll calculate the weight difference and post it just for informational purposes. Lastly, the Tesla Cane was a huge hit! I got comments like “awesome” and “epic” and one guy declared it the coolest thing he’d seen, and with some of the mechanical arms, wings, guns, and other fabulous stuff out there I was beside myself! I’ve already got ideas for Version 2 running around in my head, as well as some ideas for a “Tesla Sword” out of a basket-hilted broadsword I’ve had for years. Wow…I’ve got a ton of projects to do! I’d better get to work!